This is the classic Grand Canyon hiking tour and a perfect introduction to one of the world’s most spectacular natural wonders. 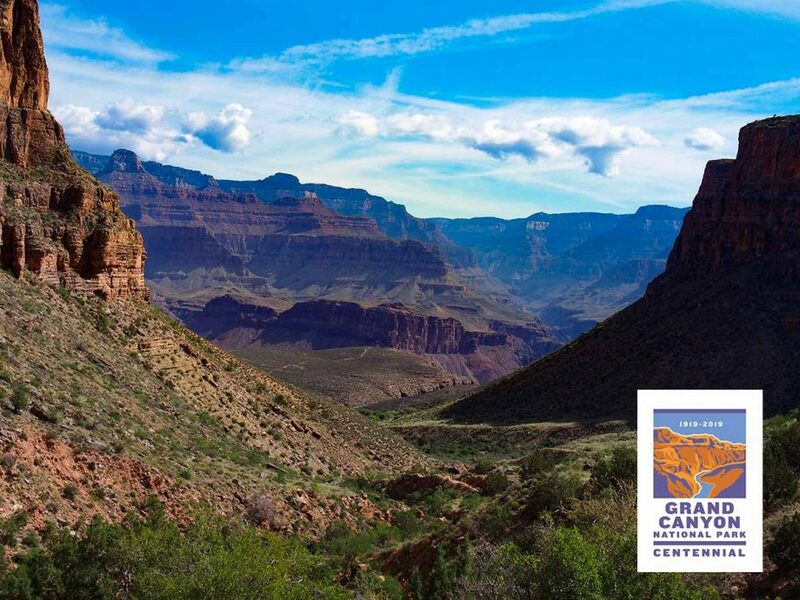 Start in Grand Canyon National Park’s South Rim and enjoy famous views, colorful galleries, historic buildings, wildlife, and ponderosa pine forests. 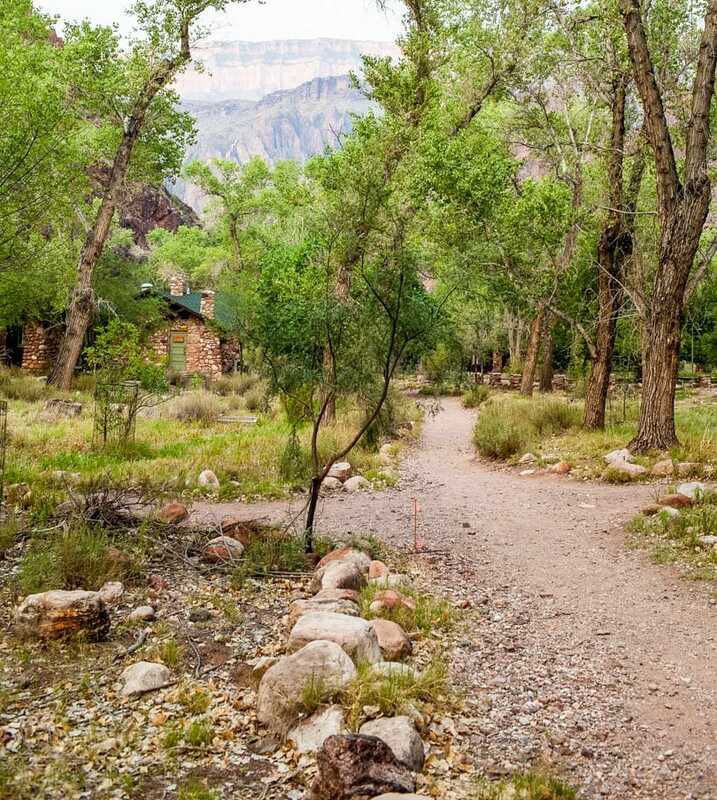 Descend the South Kaibab Trail with your professional guide and arrive in Phantom Ranch – the only lodge at the bottom of the Grand Canyon. 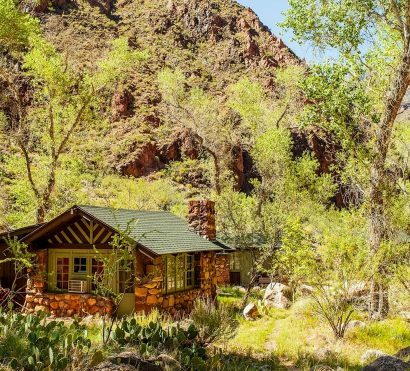 Two nights spent here allow for an extra day to explore the depths of the Grand Canyon, see the Colorado River, and enjoy the Phantom Ranch canteen. Ascend the Bright Angel Trail on Day 4 and take in the canyon’s overwhelming scope and beauty as you look back on what you have accomplished. Upgrade to solo accommodations Nights 1 and 4 – additional $289 + tax. Ground transportation from Host Hotel in Scottsdale/Phoenix area to Grand Canyon National Park on Day 1. Ground transportation from GCNP back to Host Hotel (ETA: 4:00pm) on Day 4. New Years Eve at Phantom Ranch! 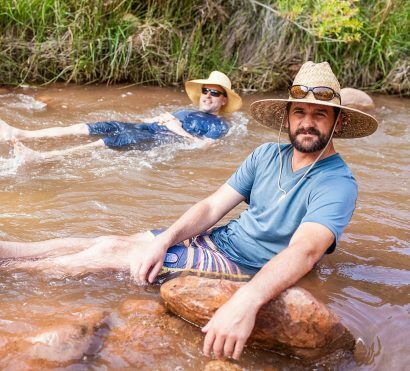 Tucked away at the bottom of the Grand Canyon, Phantom Ranch sits in a world of its own, providing adventurers with comfort, new friends, refreshment, and relaxation. 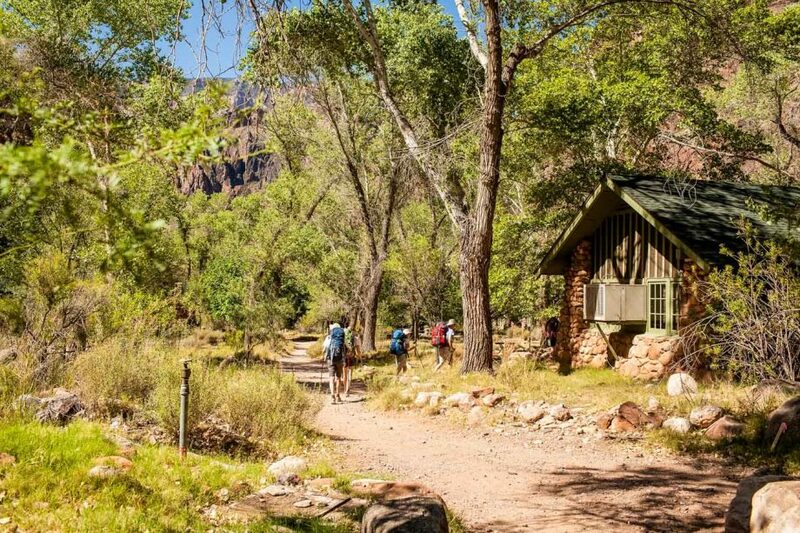 Make the most of Phantom Ranch on this guided 4-day hiking trip. Trip Start: Meet your guide and group at the El Tovar Hotel at Grand Canyon at 4 PM on Day 1. Trip End: Finishes at the Bright Angel Trailhead on the afternoon of Day 4. See Upgrades + Additions for optional transport from Scottsdale, AZ that will change the start and end time of this trip. Grand Canyon’s South Rim is the canyon’s most popular destination for sightseeing, hiking along the rim, shopping for unique souvenirs, and visiting museums and galleries that help explain Grand Canyon history. This trip begins in the early evening on day one. Our group will gather today to meet one another and get a rundown of our adventure from your guide. After this introduction, the guide will host an optional dinner at one of the rim restaurants before we retire to our rooms to prepare for our big hike to the bottom of the Grand Canyon tomorrow. Today’s descent is 7 miles and 4,780 feet into the grandest of canyons. Our route takes us down a ridgeline affording jaw-dropping 360-degree views of a labyrinth of amphitheaters, temples and buttes. 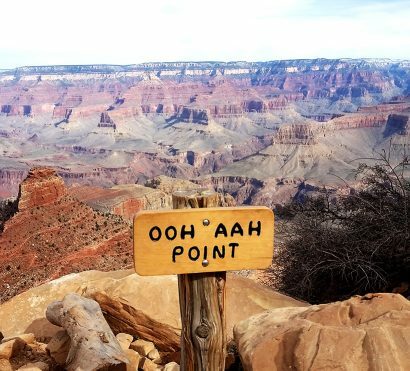 The trail begins with a series of switchbacks to breathtaking Ooh-Aah Point before we resume our descent another 1,200 feet, traveling back 40 million years in the geologic record to Cedar Ridge. From here we traverse the Tonto Plateau before dropping into the inner gorge. 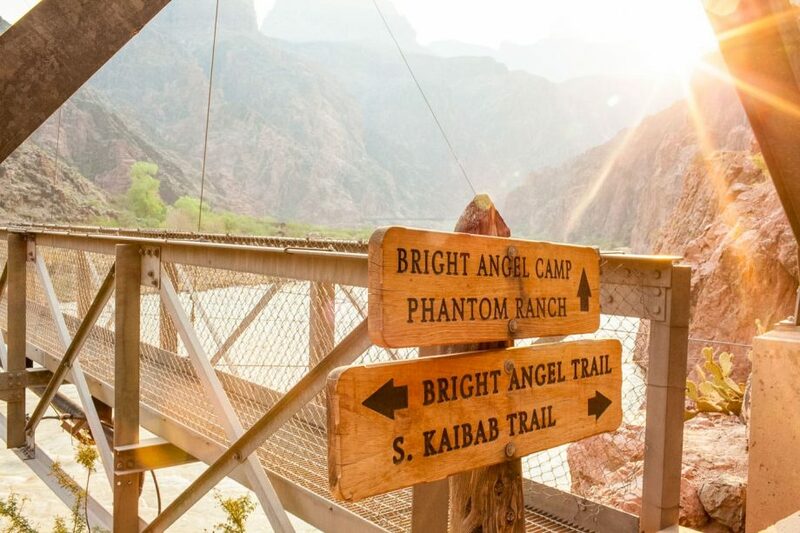 The last part of our hike takes us along the Colorado River and over a suspension bridge until, at trail’s end, we find Phantom Ranch nestled on the banks of Bright Angel Creek just before its confluence with the majestic Colorado River. Phantom Ranch was founded in 1903 as a hunting camp and named by local architect Mary Jane Colter after nearby Phantom Creek. It is the only lodge at the bottom of the Grand Canyon, and is our home for the next 2 nights. Today we plan to hike the beautiful Clear Creek and River Trails. However, many participants choose to use this day for relaxation, cheering on rafts as they pass by, socializing with other adventurers, or stretching out in the shade with a book and a cold beverage. All our meals will be at the famous Phantom Ranch Canteen. 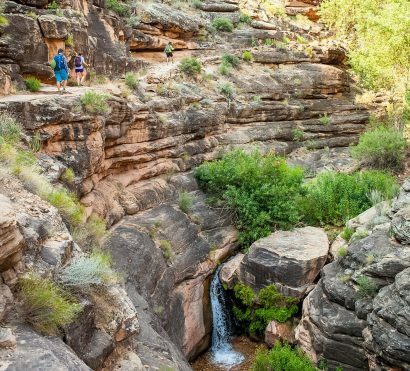 Enjoy the solitude or mix with other intrepid canyon hikers in the very bottom of Grand Canyon as the steep walls block out the rest of the world, affording a feeling of tremendous peace and tranquility. Photography and bird watching opportunities abound in this lush riparian habitat. Your guides will be available all day to share with you the secrets of one of the world’s most special places. The rising sun finds us preparing to conquer the canyon. 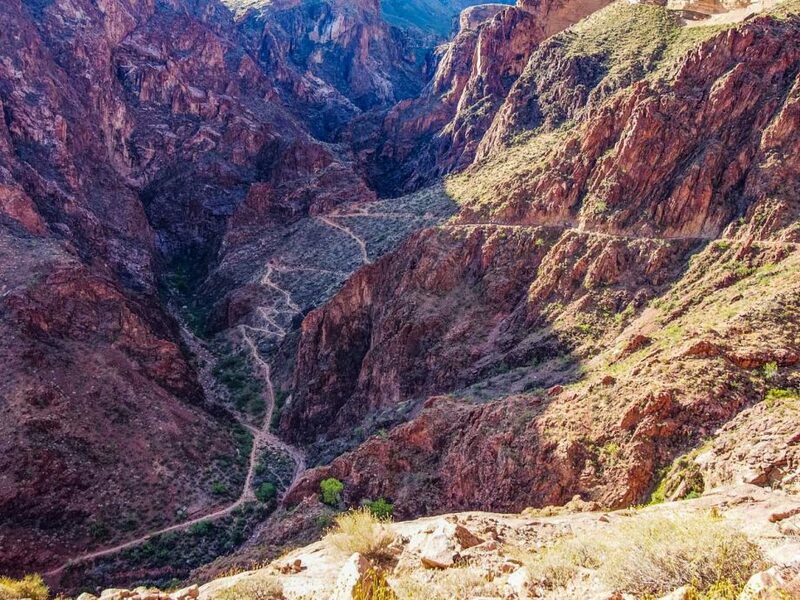 Our exit is the Bright Angel Trail, a classic Grand Canyon trek. After crossing the Colorado River, the trail snakes its way up out of the inner gorge to the shady oasis of Indian Gardens. Here we will refuel and refill with water before tackling the steep ascent up Jacob’s Ladder through the Redwall layer. While always a tremendous challenge, your guides will provide you with helpful hints, strategies, techniques, and their insider knowledge of the keys to a successful ascent. This afternoon we celebrate our accomplishments at the Bright Angel Trailhead before bidding a farewell to the canyon and the memories we’ve shared. On this trip we stay at historic lodges which can be rustic. The restaurants in national park lodges often have slow service at meals. In the canyon we stay in the Phantom Ranch dormitories. 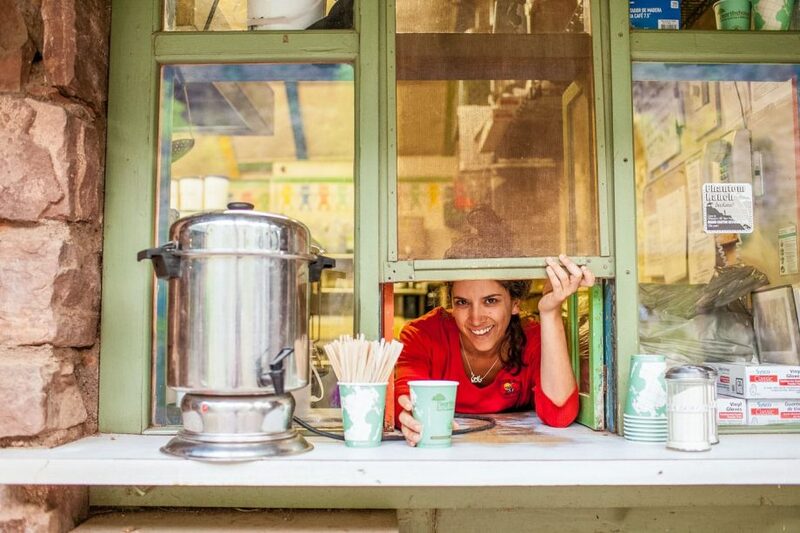 These are gender-segregated rooms with comfortable bunks for 10 people. You may wish to bring earplugs for optimal sleep. Phantom Ranch does not manage for all dietary restrictions, but with advance planning AOA is always able to supplement food for guests. Hiking: This trip is very challenging. 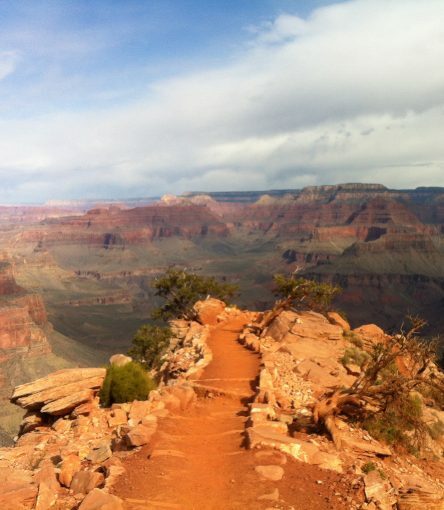 Hiking into Grand Canyon from the South Rim requires you to hike downhill continuously for 7 miles. Only 2 days later, you must hike uphill continuously for 10 miles. Weather: Weather on this trip can vary wildly from snow on the rims during spring and fall to extreme triple-digit heat in the canyon. It’s possible you could begin hiking into the canyon in the snow during colder months and during the warmer months it’s possible you may experience extreme heat in the inner canyon. We will help you prepare for any possible conditions that may arise.